If you live in Georgia and you love golf, you know the Masters kicked off yesterday in Augusta. As I type, Daniel is walking those gorgeous greens and enjoying a little piece of golfers heaven. Lucky guy! I've actually never made it down to Augusta National but I never tire of admiring those bold blooming azaleas and towering pines that are manicured to perfection for the millions of TV spectators. I can only imagine it's quite breathtaking in person! Every year, we host a Masters viewing party for the final round on Sunday. 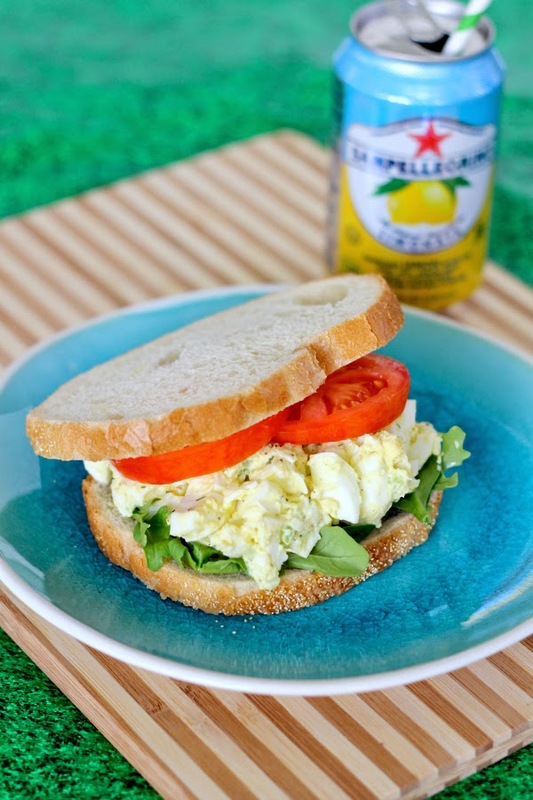 I've "mastered" my party menu which I'll post for you tomorrow but there's one recipe I've yet to share here on the blog, a classic egg salad sandwich. It's well known that there are two popular sandwiches sold at the Masters, the pimento cheese sandwich and the egg salad sandwich. I prefer pimento cheese but when egg salad is mixed to perfection like this, it's hard to beat. 1. Over high heat, place the eggs in a single layer in a saucepan and cover with cold water by at least an inch. Add a teaspoon of salt. As soon as the water begins to boil, turn off the heat and cover. After 10 minutes, remove the cover and place eggs in an ice bath for 5 minutes. 2. To peel, gently tap each egg against the counter, turning to make a crackle pattern. Start peeling at the broad end where there is an air pocket. 3. Roughly chop eggs and set aside. Then add celery, mayo, yogurt, dill, salt and pepper. 4. Chill egg salad for about 15 minutes. Then serve on white bread and garnish with lettuce and tomato if desired.